Excuse me? This is exactly why I joined Mozilla with Ben. I don’t want to access my bank in 2010 and see “You must be running Silverlight on Windows with IE 9″. It sounds crazy, but think back a few years and we were there. 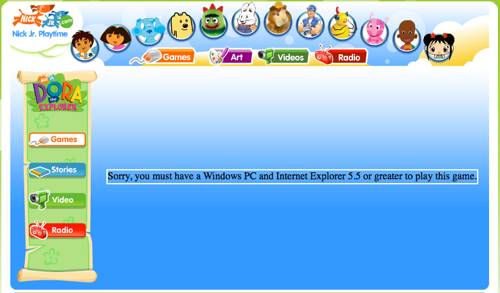 And, this message from a Dora the Explorer game reminded me that we still even have that problem today! This brings me to online games. There are so many (mainly Flash) games for kids online. It is fantastic. 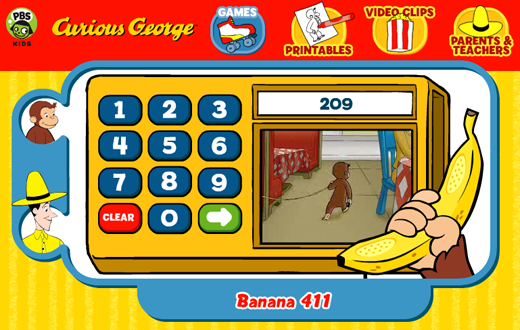 I play PBS Kids games such as Curious George with Sam for hours. The problem is that kids tend to get addicted to a game and want to play it again and again and again. Sam will want to go back to play, and it is so annoying to play the same first level once again! Let me skip! Kids really care, so game sites, please add rather than deleting if you can. There is a kid out there that loves the game, and you break his heart when you nuke it. The good news is that 5 minutes later he is onto the next thing…. but still. Any other parents run into this? Any favourite games? My son Sam loves Curious George. Wow he loves that little monkey. This means that he often asks to play the Curious George Games that PBS Kids put together. I have played these games more often that I have had hot dinners recently, and it quickly shows that although the games are fantastic, they don’t always help the kind of player that I am. The one that has played it so many times. In many of the games the man in the yellow hat (you know Ted) explains the game, and ends with “click on the green button to start”. During the monologue you can not actually click on the button. You have to wait right until the end. Let me click start immediately! These games always start from the ground floor. If you have gone through Banana 411 from the beginning 3 digit numbers to 7 digit numbers, you have to start from 3 every time. Give an expert user some love, and let them resume their game in some way. Some of the actions allow the keyboard, but most don’t. When I am sitting holding my son, the keyboard is often the easier choice. Let me use it. Kids fall in love with doing the thing they did before. When you go to a game that they are screaming in your ear, they have an expectation for what the game is going to do. Some of the games give a random few choices which can change each time. Sometimes the content from the past is just gone. This makes live painful when Sam is crying out for “Difference Dogs” and it isn’t an option this week. Archive games so you can always get to that one version your child loved. I do want to stress that PBS has done a great service to provide these games for free. Sam certainly makes the most of it. It does make me try to remember my “expert” users (or at least frequent visitors). I was recently asked about the books that I would recommend to peers. I certainly have some of the usual fare (Pragmatic Programmers, Mythical Man Month, Fowler, etc) but I had one different kind of book. I grabbed Masters of Doom which is a biography of Johm Carmack, and John Romero, who created first person shooters at id Software. It is such an easy, fun read. I completed it in one sitting. I couldn’t put the book down. I have a good friend from college who worked with Graeme Devine (who is in the book) at Trilobyte (who made 11th hour, 7th Guest, …). He told me a lot of things that ended up in the book, and always gave me a good insight into the gaming industry. And what a strange one it is. These two kids, revolutionalized the industry. The book goes into the technical challenges back in the day, and how Carmack always had a solution (after a lot of research). I recently read the book on the 2nd coming of Steve Jobs. It was interesting to think back to that as I read this book. John Romero and Steve Jobs seemed somewhat interchangable. Both larger than life. Both ‘gods’ in their worlds. Both making as many crap decisions as good ones. They also both follow their hearts. Why would a programmer want to read this? It isn’t about learning new design patterns. It is about getting inspired. After reading the book I was ready to take on the world. I was ready to open up IntelliJ and start coding. I have flights to Boston for a No Fluff Just Stuff this weekend. Then, the weekend after, I am flying to London for the weekend (friends wedding). I just finished a great book, and was thinking about what I would be doing on the plane. Then suddenly I got up, and went out to buy a Sony PSP. I am a FIFA fan, but since I have so many of those, I went for the World Soccer game. I also grabbed Wipeout, which seems really fun.